Sew N Ink: Birds of Feather stick together! Birds of Feather stick together! This post will be a 'bird theme showcase' featuring the newest addition in Bigz dies to SU in the new Autumn/Winter Mini catalogue. so here's a few ideas I've come upon in my researches and made for my launch. The concept for this project orginally came from some inspiration from another usa SU demo - Janet Wakeland- an interesting turn of events, as I cut out some paper for the 'circle part' used our current scallop border punch and went to start scoring in the lines on the scoreboard only to discover that if fact the lady had used a USA new 'big shot' die that cuts and scores the lines either side of the scallops without the small little 'solid' scallop between that we have with the border punch- turned out to be a bit tricky for me, so I settled on a 'fan' idea instead, added the 'create' sentiment as well and the antique tag. this card is a CASE from Kimberly Van DiePan, she used the SAB Everyday Enchanted on her original design. I love this set in its entirety but even more so the postage stamp one! Oh my goodness it my travels to retrace the origins of these orginal designs that I have found in 'googling' -Elegant Bird, I discover that in fact most of these following designs are our SU Founder's projects- Shelli. She has inspiring taste and style for which I'm grateful! - Yay you got me!!! I'm considering using this firstly as a special '50th birthday card' for my hubby's upcoming milestone. I notice on closer inspection that Shelli's version may well be a mini album which I could later turn the front of this card into a 50th memorabilia mini album for my hubby. I say when something is so nice why 'reinvent the wheel'! Found this example on the net and cased it- I'm pretty sure its a 'Shelli' project that was a WOW presentation at the recent USA's leadership conference. 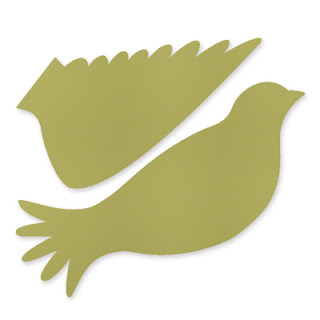 I've seen similar versions of this idea where fabric is used with the Bigz Elegant Bird Die. I think it would make a great wedding table deco or even one of those arm decorations that are given to brides as they walk back down the Aisle. My mind is turning over yet for other fabric ideas on this one! So here's to the new bird die and her many styles of use! Wow..Ruthy when you said you were busy preparing for your launch, you weren't kidding! !